World of Warcraft shows a new blend of the classical narrative – a mix of the linear personal viewpoint and the communal persistent world. It portends new forms of entertainment. A new form of entertainment entered the mainstream two weeks ago, much unheralded. Blizzard released “Wrath of the Lich King” (“WotLK”) – the most recent installment in the World of Warcraft (“WoW”) saga, the mega successful online multiplayer game. Much can be said about what Blizzard “gets” in regards to online gaming, but the most significant new pearl is a new technology that begins to merge the personal narrative with the shared world experience. WotLK is really only toying with the concept so far, but it’s an omen of what is a significant development in entertainment. Allow me to elucidate. The immersive entertainment format – entering a virtual world of some flavor – has always had to negotiate the fundamental tension between a personalized storyline (the narrative) and the demands of a social environment (namely, a shared world). If the immersion is to be fully social, then the narratives need to be subsidiary to the world as shared by the participants. For those of you who are not online gamers, let me give you a trivial example as illustration. Consider a murder mystery, the classic Agatha kind where more people die as the story unfolds. If the mystery is expressed in a shared virtual world, then everybody with whom you are sharing the experience with needs to see the same people being dead at any given point on the storyline, or it won’t make sense. But that requires everybody to be online at the same time. Since that would overly restrict the medium, the solution has been to distinguish between a shared world (that either doesn’t change or everybody sees any changes at the same time) and some variation of what Blizzard calls an “instance” – in the murder mystery example, it would be a house that, if you enter with some friends, the murder mystery would unfold for that group of people. It is similar to the difference between a book and a movie – you can read the book at your own leisure, but a movie with friends needs to be on the calendar. What Blizzard has done to dramatically alleviate this is to develop “phase zone” technology. The shared world has parts where there are multiple alternative realities at any given time – think of them as parallel universes in one locality. The pictures below show one such example from the game (spoiler alert!). 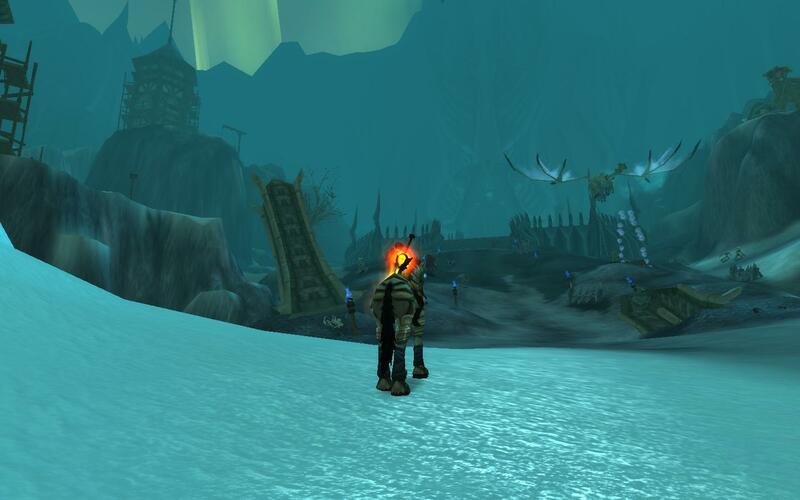 In the first (top) picture, a warrior is gazing towards Wrathgate, seeing frost wyrms in the air and an ongoing battle before the gate. In the second (bottom) picture, another player, a warlock, gazes of the same scene, but sees the fiery aftermath of a battle. However, both players are actually logged in at the same time and are standing right next to each other – at least according to the game “radar” that shows where your friends are. Yet the players can suddenly not see each other. The players have entered a zone where a different reality is presented to different observers, dependent on past events experienced by each. 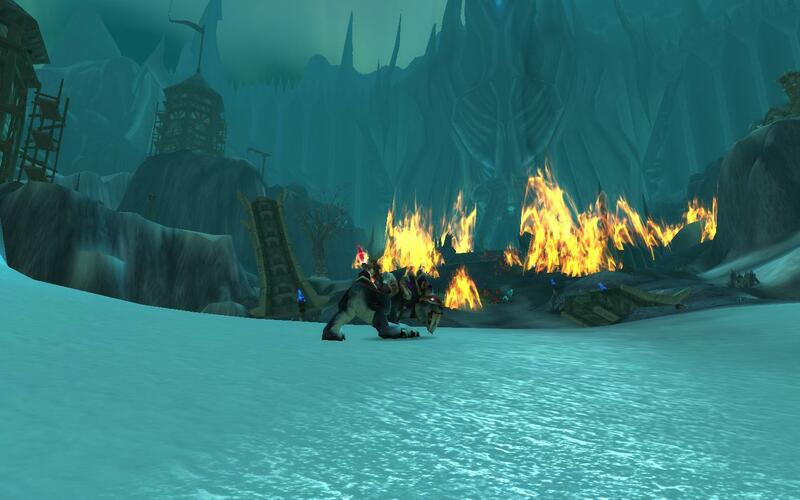 In the lower picture, the brief battle that is the first assault by Alliance and Horde against the Wrath Gate (the Lich King) has already occurred, and all that is left is fire, brimstone, and fleeing survivors. The two players can ride side-by-side towards the gate, but right before it comes into view, they enter separate universes. The sound effects are different too, one player hearing the screams of survivors, the other hearing the grunts of the preliminary battles. Blizzard calls this “phasing technology”, according to producer producer J. Allen Brack (in an interview). It has surprised me how little attention this “feature” has received. Because it’s not a “feature”, it’s a whole new take on the fictional narrative. NAG calls the technology “quietly amazing” which I think is an apt phrase. Many thanks to North for lending me her account for the picture-taking! Very nice! Good job “catching” the “changing world”… oops! It wasn’t you, who caught it first, it was D.! Didn’t see you mentioning that 🙂 Other than that, thanks for writing the blog. Very informative, esp. for us, the not online gamers! How will the virtualization industry will face the crisis? will it survive? Transitive was acquired by IBM last days, will something similar occurr with other major companies like VMWare and smaller ones like Virtutech? Regards. [PSM] Well that’s kind of off-topic 🙂 and I can’t answer on any specifics relating to VT. Virtualization as a stand-alone value proposition is maturing and as always happens in a maturing industry, there is consolidation.